Laura Grain is a British artist, based in London, who created the piece above, which I am currently completely obsessed with, in 2013. 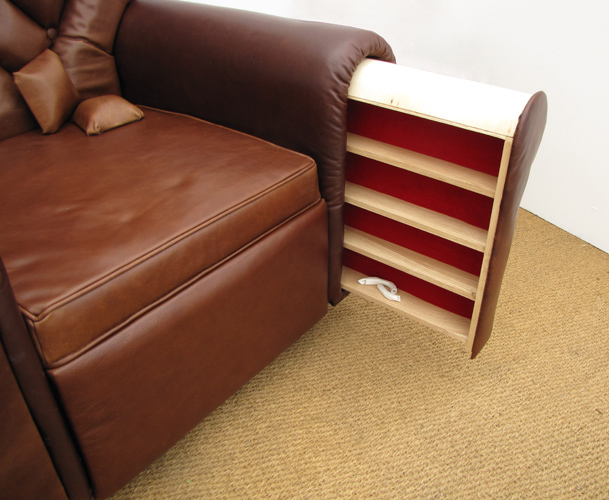 It’s a comfortable armchair with various compartments, shelves and hiding places for … well, any little secrets you like, really. When the piece was shown, she added an interactive element of posing the question of who would have owned this piece, and allowing a wall space where people could pin their responses. Laura’s work is stunning and original, I highly recommend you check out her website and take a look at her gallery. Previous postMichael Bay, Giant Robots & Emerging Markets: How Hollywood investors are learning to stop worrying and love the kaiju.